I have loved working with wood as long as he can remember. When I was young his dad always had a workshop. In our houses in Maryland and Virginia that had basements that's where it was located. When we lived in Houston, Texas for a few years he had a small shop added to the garage and his shop in Granada Hills, California took over the entire garage. There was no space for an addition there and no basement. While my dad was mostly a physicist but he did a lot of things, including woodworking, in his shop. He taught me to use the table saw, over arm saw, drill press, and some other tools. When Pam's Great Uncle Dan passed I inherited his small Craftsman bandsaw, a grinder and a Shopsmith because the family knew I'd use them. My dad taught me how to use the Shopsmith as a lathe. I learned a lot from form my dad. Like almost all boys growing up in the 50s and 60s I took shop classes in junior high school (now they are called middle schools and tragically the shop classes are gone). Those classes were a lot of fun and I learned a lot. I still have some of the projects I made in my metalshop and woodshop classes. Photos of two of them are in my Projects section of the website. In high school during the mid-1960s I wasn't able to take any shop classes but I did continue to make things out of wood. I still have a couple sets of bookshelves that I made from real mahogany for my bedroom during those years. I have a photo of one in my Projects section on this website. After I got married and we could afford to buy our first California home, like my dad, I took over the garage for a workshop. It worked out great. I moved all my tools from my dad's shop to my own garage. In those days, however, money, especially for luxuries like tools and wood, was extremely tight. School teachers who are starting out don't make much money. I did manage to save enough for a Craftsman contractor style table saw, a portable drill, circular saw and a few other tools. Most of them were among the cheapest available at the home center of the time, Builder's Emporium. Since I was teaching full time and deeply involved in a church choir my woodworking time was limited. Between my workshop and my dad's I did manage to make some furniture for our home as well as other projects. In 1964 the pastor of our small church needed some bookshelves for his home office. I made three full height sets of shelves for him and installed them. That was my first major project where I made something for someone outside our family. Pam and I were engaged when we were in college and were married in 1971. At the time we into what they called "Early American" style of furniture that was popular in the 60s and 70s. I built a coffee table and end tables for our first apartment living room in that style out of solid ash using my Dad's workshop. Due to the style I turned a lot of spindles and legs for the tables on the Shopsmith. After we moved into our first home and I had the table saw I made a trestle table out of solid ash for our dining room. I had to make the top over at my dad's shop because I didn't have any clamps. For some reason a few years later I became known as a mantle maker and built several for family and friends. Today I wish that I had photograph of all those projects. I had been reading Fine Woodworking magazine since the very first issue came out in 1975. The true early American styles of furniture and other styles featured in the magazine really fascinated me. Pam and I even toured Williamsburg, Virginia partly so that I could see the beautiful furniture and visit the cabinet maker's shop. It's a trip I'd recommend to any woodworker. Articles such as Queen Ann Styling in the Summer 1976 issue and Cabriole legs in the Summer 1977 issue provided some design inspiration and an article on doweling by James Krenov in the Summer 1977 issue showed me how I could put pieces of wood together without screws. As a result I built a hall tree for the entry of our home. I built it with Cabriole legs with spoon feet for the front legs and I carved a fan shape in the drawer. Since my joinery skills were limited I used dowels for all my joints using a Craftsman doweling jig and dowel points from Sears. Photos of that hall tree are in my Projects section of the website on the Furniture page. You might call that my first piece of fine woodworking. When we bought our second home in Simi Valley, California Pam made it clear that both cars would be parked in the garage. She didn't want them parked on the driveway all the time anymore. The garage in that home did have a small side section where I could put a workbench and some tools but my larger woodworking tools were relegated to the back of the garage up against the wall under some hanging cabinets that were there when we bought the house. There was no space between the bumpers of the cars and the machines. These machines were pulled out only during the day when I was working on a project and I never used the Shopsmith. I found this arrangement very cumbersome and usually turned to other activities to take up my leisure time. I did still manage to turn out some projects while we lived there but most were more utilitarian than fine woodworking. For most of the time we lived there, except for small projects, the closest I came to fine woodworking was another mantle project for that home which is shown on the Home Improvement page. When I neared retirement I told Pam that I needed to get back into woodworking and to do so our next home had to have a dedicated workshop space. She agreed and allowed me to start purchasing new tools before I retired starting with a SawStop to replace my 1970s Craftsman table saw. Pam knew how dangerous and difficult that saw was because she had helped me make cuts on it over the years. In addition I started adding other machines to my arsenal of tools. They included an 8" Grizzly G0490 jointer, a bench top Delta drill press and a Steel City bench top mortiser prior to our move. Yes, the vehicles except for our customized PT Cruiser ended up out on the driveway. Fortunately Pam was very supportive of my tool acquisition and moving her car and our van out of the garage. With these acquisitions I started pursuing more woodworking projects again even before we retired and moved. I made a few trophies for the basset hound clubs we belong to and a few other things but nothing substancial except for the mantle project that we had to leave behind. I did take a class in woodworking through a Woodcraft and built a Shaker side table shown on the Furniture page. Some work on that table was done as "homework" in my garage. As we approached retirement we found a home on over an acre of property in Fallbrook, California. This is a beautiful semirural area in Northern San Diego County. It sort of reminds me of "Wine Country" in Northern California. The home had neither a workshop nor garage. With Pam's full support I started designing a workshop/garage building to go on a level area between the house and driveway using some software on my computer. The spot was obviously planned for such a building by the previous owner. My video on the shop's construction tells the rest of the story much better than I can here. I was finally going to have my dream woodworking shop. Recently I decided that my venture into woodworking needed a name. Since I was a kid my dad always named his hobby ventures WB because they were his last two initials as well as those of my brother and I plus my dad's father and grandfather. When I was very young my dad smoked a pipe and made custom pipes from wood, metal and plastic. He had the WP Custom Pipes company. At one time we even had a HO railroad layout featuring the WB Railroad. I can still remember the little engine with WB on the side going down the track. Somehow, by sheer coincidence, when Pam and I were thinking of a kennel name for our basset hounds we came up with Woebgon Bassets which went along with the WB theme from my childhood. So, in keeping with that tradition WB Fine Woodworking was born. In order to tie the name into our bassets which are very familiar to all who know us I decided to use the silhouette of our basset, Joy, as part of the logo. I used a circular saw blade because most of my work includes working on my table saw. The words, "Fine Woodworking" were printed in an Arts and Crafts style font because that's my favorite style of furniture and architecture. Where things go from here is totally unknown. As I've mentioned elsewhere getting my workshop organized is my current priority. I'm tired of the mess and searching for tools that should be readily available. I'm also adding some finishing touches to the shop/garage that I never had time to do before and my health has improved. Now that I no longer have a low limit on my Internet data from my Internet provider, a common curse for those of us who live in rural areas, I've been able to view numerous videos and photos from woodworkers including their workshops on YouTube, the Fine Woodworking magazine website and other places on the Internet. I've recently discovered Instagram and the vast woodworking community that posts there. 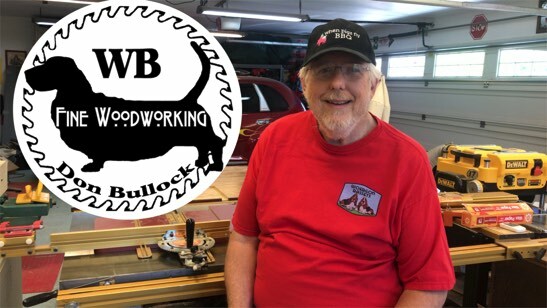 Those combined with Facebook and the woodworking forums that I've been visiting for many years plus numerous woodworking magazines and books have now all given me the ideas and inspiration to get going on the shop clean up/renovation and start building things. Thank you all for your inspiration and ideas. My present projects include building a workbench and a toolwall in my shop. Since 1976 I mu workbencs has consisted of a Black and Decker Workmate. I bought one of the original Workmates to be sold in the USA. While it has served me well and all my projects since then have been built on it it's about time that I have an actual woodworking workbench with vises to hold my work. As I mentioned above, cleaning up the shop and organizing it have been my current priorties. Making a tool wall and eventually come cabinets are part of that organizing task. I've found that the tool wall that I currently have is filling up quickly and I know I'll need more space. Since my workbench will be situated under the windows of my shop I've devised a way to use the window openings as a place to hang more tools. I'm working on a way to stire them there but still have full access to the windows behind them. Since you have found this website you may already be familiar with my social media accounts. Just in case you aren't I've included links to them below. I'm especially proud of my YouTube channel. The channel is still very new and I need better audio and lighting equipment but I'm improving as a host. It's a great way to share my ideas and techniques as well as the projects I make with others. I spent over 36 years teaching in a classroom so teaching and inspiring others comes naturally. If you're interested please subscribe to my YouTube channel. The number of subscribers that a channel has as well as viewed minutes are used by YouTube for their rankings. Also follow me on Facebook and Instagram. The more followers and views I have the better my rankings will be on them as well. My hope is that others will be somehow inspired by what I do and that I can be helpful to others. Pam and I spent most of our adult lives teaching. I don't plan to stop now. Thank you for your support.